What is being billed as the Eastern Mediterranean’s first shore-power facility is set to be inaugurated next week thanks to the Electrification in the Eastern Mediterranean (Elemed) project. The Ro-pax Fior Di Levante will plug in at the port of Killini in Greece on Thursday December 20, 2018. “Through the installation of this green pioneering cold-ironing facility, developed within the European co-funded programme elemed, the port of Killini achieves a decline in air pollution, upgrades port facilities while paving the way for other Greek ports to become emissions-free hubs in the Eastern Mediterranean region,” Elemed said in a note on its website. 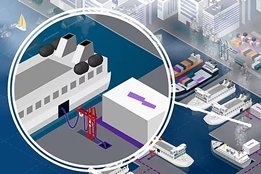 Plugging in to shore power allows vessels to turn off their main engines and reduce at-berth emissions. Subject to how the electricity is generated, it also provides opportunity to reduce lifecycle emissions.